"I think this is the historical moment we're in — we have come to define religion in absolutist, fundamentalist terms. So to be a believer is to be a fundamentalist in some fashion. And I guess what I was trying to describe is a faith that admits doubt, and uncertainty, and mystery. Because, ultimately, I think that's how most people understand their faith. In fact, it's not faith if you're absolutely certain. There's a leap that we all take, and, when you admit that doubt publicly, it's a form of testimony. Then what I think it does is it allows both the secular and the religious to find some sort of common space where we say to each other, Well, I may not believe exactly what you do, what you believe, but I share an experience in wondering what does my life mean, or I understand the desire for a connection to something larger than myself. And that, I think, is in the best of the United States religious tradition." It's very close to my own account of the kind of faith I sketch in my book, It's close to David Kuo's assessment of his faith. 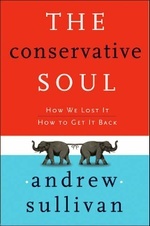 Money quote from "The Conservative Soul:"
As humans, we can merely sense the existence of a higher truth, a greater coherence than ourselves, but we cannot see it face to face. That is either funny or sad, and humans stagger from one option to the other. Neither beasts nor angels, we live in twilight, and we are unsure whether it is a prelude to morning or a prelude to night. In [non-fundamentalist] faith, doubt is not a threat. If we have never doubted, how can we say we have really believed? True belief is not about blind submission. It is about open-eyed acceptance, and acceptance requires persistent distance from the truth, and that distance is doubt. Doubt, in other words, can feed faith, rather than destroy it. And it forces us, even while believing, to recognize our fundamental duty with respect to God's truth: humility. We do not know. Which is why we believe. Could Obama lead conservatives of doubt out of the wilderness? Into the Democratic party? I was deeply impressed by his speech on religion and politics back in June - and that address is worth re-reading alongside the Remnick interview. Or should we we only lead ourselves? I'm open to any possibility that can restore the right order to faith and politics in America. I think a quiet rebellion among moderate and tolerant Christians is taking place. Recapturing humility for Christianity, reunderstanding the centrality of doubt to faith, accepting mystery as faith's core, making faith alive and integrated into one's full soul and being: this is our truly difficult path. I make a longer and deeper defense of this kind of Christianity - non-fundamentalist Christianity - in my book. I'm a believer. In the same God as the fundamentalists. In the same Jesus. But in a slightly different way. I'm glad Obama is open to that approach, because it is, in my view, as essential for Christians to reclaim their faith from extremism, as it is for moderate Muslims to reclaim theirs'. A great deal is at stake in that bettle within religions right now. And Obama seems to understand that. Which is vital in a potential president in this decade.